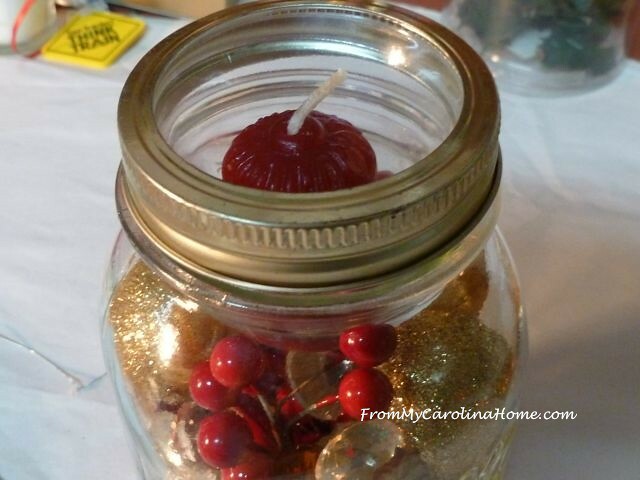 Last year I accidentally discovered that a flared votive candle holder will fit the top of a Mason or Ball canning jar. 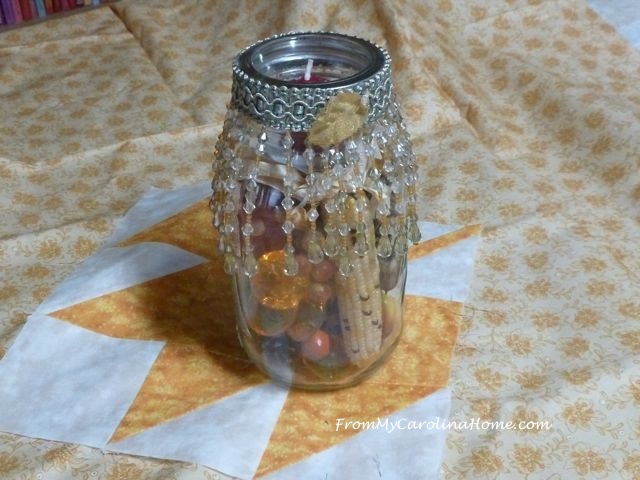 That post is here showing a filled jar with the candle. I wanted to enter a jar with that concept into the fair, but I knew that two glass pieces not held together would be a problem. 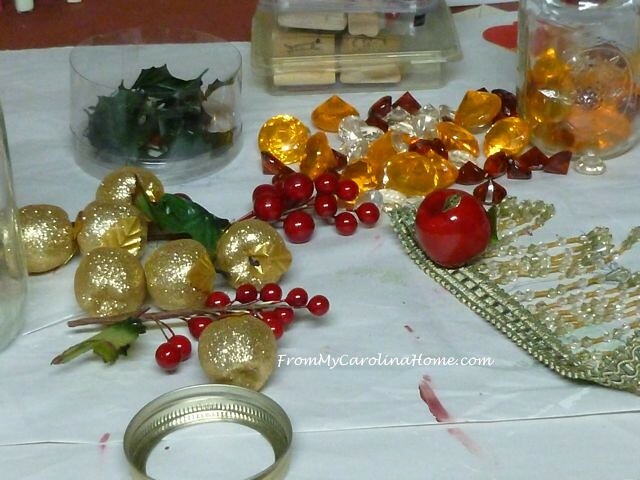 Still, I had some goodies to use, more gold apples and some red berries. I also found some jewels on a clearance rack (couldn’t resist those!). 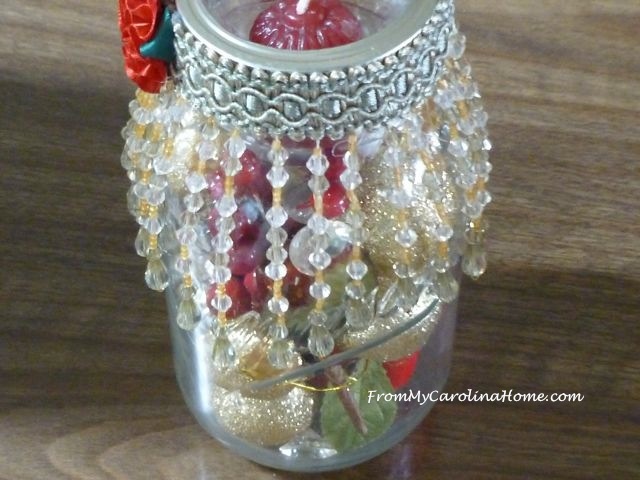 I put the apples inside, then set the votive holder into the top. Then I wondered, would the ring part of the lid fit over the votive holder? Well, yes it did! I took it back off, and started playing with the fillers. 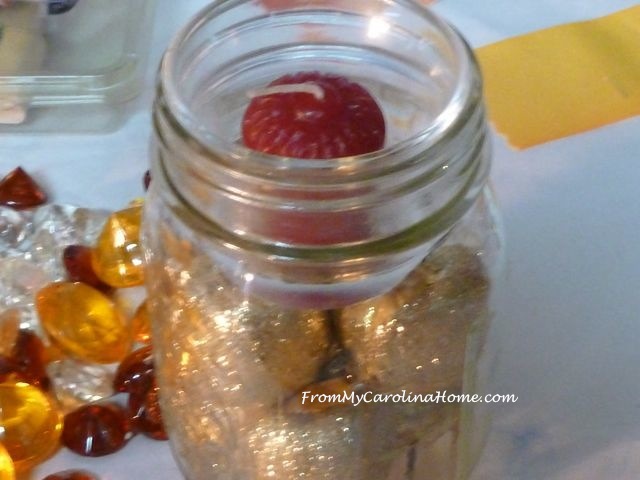 The glittery gold apples were perfect for a holiday decoration, along with some fake cranberries. I added a couple of red apples too. 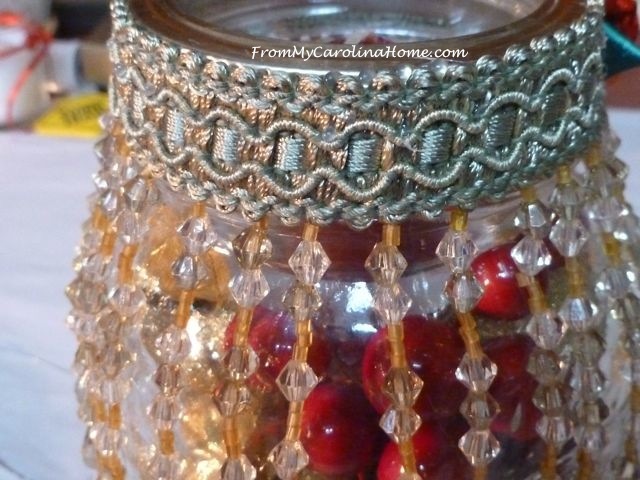 I had this wonderful beaded trim left over from another project, and it was just enough to go around the jar ring. I hot-glued it onto the ring, then replaced it on the top over the votive holder. I added a ribbon rose to cover the seam. 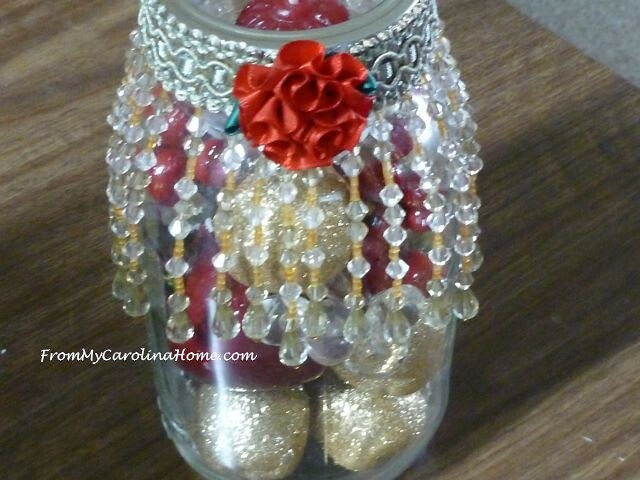 Some of the clear jewels are in this jar. The green and gold beaded trims goes nicely with the fall colors too, so I can use it now and then into December. Those gold and root beer jewels go well for autumn. I think changing the ribbon rose to a gold one would go better through the fall holidays. I had a little corn cob, and some fall leaves to go with the tiny pine cones and fall color fillers. The red rose was changed to a gold leaf. All I have to do now, is open it up again, and change the inside items to change holidays. One caveat, although I am showing this with a real candle, I recommend using a battery operated one for safety with a trimmed jar ring. 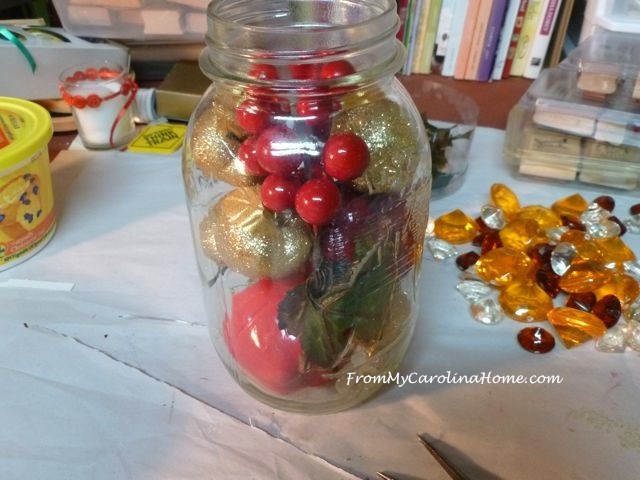 Have you started any holiday crafting? Pretty! Have some jars and trim! This is a darling idea. 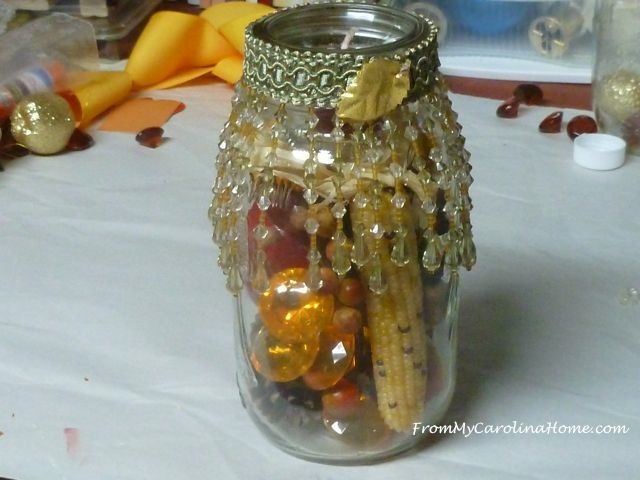 I love the beads around the jar. Carole, I had already posted a comment when my laptop decided to go funky on me. So let me begin again. Kevin enjoys canning and received hundreds of free Mason Jars a few months ago. I do not think he will miss a few of them if I can manage to make wonderful decorations and/or gifts with a few of them. Your ideas are brilliant and so pretty! I have recently been experimenting with bead hand embroidery and have found several other fabulous ideas that I would like to try. I do not do a whole lot of decorating for the holidays and not many of my family members like or appreciate home made gifts. So, I do not do much in that respect either. 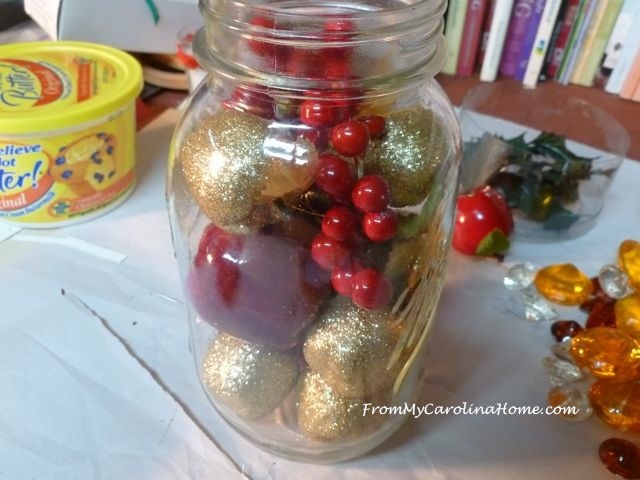 Although, I did see some beautiful wreaths with great and easy tutorials that I would really like to try. 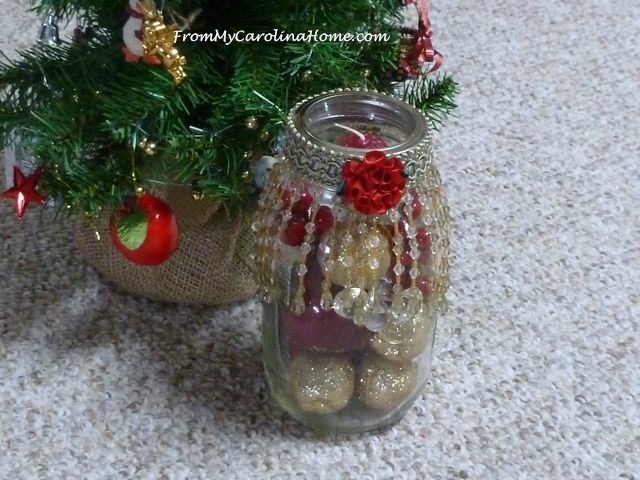 Thank you for sharing this brilliant and beautiful decorating idea. Have a wonderful creative day! These are lovely …so festive with that trim! !